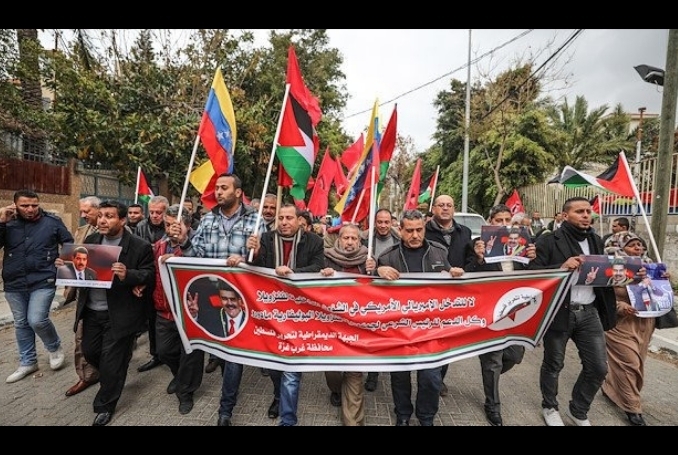 Hundreds of Palestinians took to the streets of besieged Gaza to show their support of the democratically-elected government of Venezuela and it’s legitimate leader, President Nicolas Maduro. Venezuela is struggling to defeat a coup attempt that is supported by the United States, Israel and many Western governments. The relationship between Venezuela and Palestine has been particularly strong under the presidencies of late Venezuelan leader, Hugo Chavez and current president Maduro. Neither leader has missed an opportunity to show their solidarity towards the Palestinian people, a fact that has always irked Tel Aviv and its western benefactors. The Gaza rallies, however, were more than a display of gratitude towards a country that had enough courage to break off ties with Israel following the latter’s 2008-9 war on Gaza – a bloody campaign known as “Operation Cast Lead”. Thousands of Palestinians were killed in that one-sided war. No Arab government that has diplomatic ties with Israel severed its relations with Tel Aviv. While Caracas – over 10 thousand kilometers away – did. Then, former President Chavez, accused Israel of “state terrorism”. But there is more to Palestinian solidarity with Venezuela than this recent history. Palestinians have experienced decades-long collective trauma from US-funded Israeli colonialism and military occupation. The US has imposed itself as an ‘honest peace broker’ as a way to mask its political interference and meddling in the Middle East, while fully and blindly supporting Israeli aggressions. While the Venezuelan people have every right to protest their government, demanding greater accountability and economic solutions to the crushing poverty facing the country, no one has the right to meddle in the affairs of Venezuela or any other sovereign country anywhere. We must remember that the US government has hardly ever been a source of stability in South America, certainly not since the Monroe Doctrine of 1823. Since then, the US has done more than mere meddling, but outright political and military interventions, supporting various coups that toppled or attempted to overthrow democratically-elected governments. What is underway in Caracas is a repeat of that sad and tragic history. The unhealthy relationship between the US and its southern neighbors took an even darker turn when, in 1904, then US President Theodore Roosevelt declared the “right” of his country to hold “international police power” in Latin America. Since then, the entire region has been Washington’s business. Always looking for opportunities to exploit, Washington now sees a chance to undermine Venezuela and its elected government. The Venezuelan people are dealing with overwhelming poverty and a very unstable social situation. Hyperinflation and the crumbling of the country’s oil industries led to a dramatic economic downturn, with about 10% of the population fleeing the country. Poor policy choices led to an escalation of the already endemic corruption, to a significant weakening of local production and increasing devaluation of the country’s currency. However, consensus around president Maduro’s socialist government is still broad, as witnessed by their victory in the 2018 presidential election. Despite the presence of about 150 international observers from 30 countries and international organizations, which declared that the last Venezuelan election was transparent, domestic opponents, supported by the US and its western and regional allies denounced it as “fraud foretold”, even before Maduro delivered his victory speech. The US and its Western allies are frustrated by the fact that despite its economic problems, most Venezuelans remained united around Chavez, and now Maduro, who are perceived, especially by the poorer classes, as independent national leaders fighting against constant US destabilization and neocolonialism. The world order is vastly changing, but US ruling elites refuse to change. While speaking about Washington’s need to “protect democracy” in Venezuela, US National Security Advisor, the infamous Israel supporter, John Bolton admitted that the coup in Venezuela is an opportunity to exploit the country’s oil and natural resources. Tragically, the US boycott against Venezuela forced the country to sell its gold in return for valuable currency, as well as consumer goods, food and medicinal products. The coup is meant to completely push Caracas to its knees. Western predators are all moving in, each party playing the role entrusted of them, as if history is repeating itself. Bank of England (BoE) has blocked Maduro’s officials from withdrawing $1.2 billion worth of Venezuela’s gold. Worse, brazen interference from foreign countries is becoming so pronounced that UK foreign office minister, Sir Alan Duncan has suggested that the BoE grant access to the gold reserves to the self-proclaimed opposition leader Juan Guaido. Germany, and France and Spain gave Venezuela’s Maduro an ultimatum: the President has eight days to call elections, otherwise they’ll recognize Guaido as president. On January 31, the European Parliament recognized Guaido as a de facto leader of Venezuela in complete disregard of the democratic rights of the Venezuelan people. Yet, as odd as this may seem to some, Maduro still enjoys greater legitimacy in his country than Donald Trump or Emmanuel Macron do in the US and France respectively. Yet, no entity is threatening to intervene in France, for example on behalf of the ‘Yellow Vests’, who have protested in their hundreds of thousands for weeks, demanding an end to Macon’s rule. It is doubly important that Venezuela doesn’t collapse before this US-led sinister campaign because of the rising far-right powers in South and Latin America, namely the upsurge of reactionary forces in Brazil. If Venezuela’s political order disintegrates, others, too will become target: Bolivia, Cuba, and even Mexico. Since the US partial withdrawal from Iraq in December 2011, and the Obama Administration’s ‘pivot to Asia’, to challenge the inevitable dominance of China, US policy makers have been keen on staging a comeback in South America as well. More recently, the just-departed US ambassador to the UN, Nikki Haley was instrumental in shaping the aggressive US policy towards Venezuela. Now that the country is struggling with extreme poverty – itself resulting from the manipulation of oil prices – the US sees an opportunity to make its move, and reclaim its destructive, domineering role in that part of the world. The election in Brazil of far-right leader, Jair Bolsonaro, who wants to “make Brazil great again’ is tipping the balance in favor of reactionary forces in the whole region. But the plot against Venezuela is also an opportunity for those who want to challenge the old order, to tell the US government ‘enough is enough’; that the age of coups and blood-soaked interventions should be behind us, and that South America must not be subjugated again. As Palestinians have fought Israeli tyranny for years, Venezuelans will continue to fight foreign tyranny and unlawful political and military interventions as well. And with true and tangible global solidarity, both nations will prevail – sooner or later. – Romana Rubeo is a writer and freelance translator based in Italy. She holds a Master’s Degree in Foreign Languages and Literature and she is specialized in Audio-Visual and Journalism Translation.